Formulation: Carrot, calendula and anthyllis soothe delicate skin while apricot kernel oil, jojoba oil and beeswax moisturize and soften dry skin and visibly smooth fine lines. Neem leaf and silk powder fortify and firm. Rich but not greasy...skin feels smooth and moist till the morning ... I wish i could wear it during the day but it is a little too rich for daytime. But not this. The area around my eyes stays moist all day and it helps receive under eye cover up well as it stays moist all day. I was asked by a Chanel rep from Europe what I used under my eyes! I said, Dr. Hauschka! Dry/cold air? Eyes, meet your SALVE-ation! Only the smallest amount is required for the heavy-handed gals. This product softens the eyelids and smoothes puffy under eyes Fabulous! A little goes along way. I am able to wear it during the day when I don’t wear makeup. I also wear it at night. It really hydrates my under eye area. I’ve been using eye balm for years at night and when it is winter time during the day when no makeup is being used. It is so soothing and gentle on the skin around the eye. Actually, I’ve never been without it. I also use it to clear off stubborn makeup. Another fabulous product from Dr Hauschka! This is my 4th purchase of the eye balm -- I love it. You don't need very much, just a tiny bit goes a long way. Feels very protective and nourishing. Thank you for your review. We are happy to hear you are a fan of the Eye Balm! We are proud to tell you that Dr. Hauschka USA has been the distributor of Dr. Hauschka products in the USA for more than 50 years. We have not been sold, nor has the manufacturer of Dr. Hauschka Skin care in Germany, where all Dr. Hauschka products are manufactured. The size and price of the Eye Balm has not changed in the last several years. Please contact Customer Service if you have any questions. The eye balm is my “go to” Dr H product! I struggle w/ some contact dermatitis spring and fall in my area, this is the only thing that doesn’t make it worse! I need moisture on the delicate area under my eye where the dryness comes. This product is my all time favorite! When I put on this balm it gives me a feeling of really nice deep hydration, however, beware that it's very shiny when first applied. People might wonder what happened to your face. Even though it's made for day use, I apply it before going to bed to make sure it's well absorbed by the morning. I use this before going to bed and leave it on the whole night. It reduces the fine lines and paper like skin on my eyelids. It lasts a really long time (over 6 mo). The only complaint is that it takes a while to be absorbed so you can't use it as a primer under makeup and you can't go out just after putting it on or else you'll have glossy lids and look ill. I used this product very regularly in my 20s and today my skin is still seeing benefits. The skin under and around my eyes looks almost the same as it did 15 years ago and I believe it was due to daily use of this product - which I have to get more of! Taking great care of my skin with the cleansing cream, toners and moisturizers, but would like to purchase this product again soon. It has a nice smell too. You only need a very little bit of this for results. I dab a small dot on my finger and spread around my fingertip then gently press/dab onto the skin around my eyes. This cream soothes my skin and dry areas on the outer corners of my eyes. It smells great and I do like how thick it is. Being a nurse aromatherapist, I have researched this company and have been using Dr. Hauschka's products for years. This is a must-have for me. Love it!! Keeps eye area soft- non irritating. Love that the container is not plastic too! I use this every morning and the Daily Hydrating Eye Cream every night. It feels nice on my skin and seems to protect my delicate eye area. I have sensitive eyes and this never irritates them in any way. I love love love this moisturizer. It does keep my sensitive skin nourished and moisturized and prevents fine lines from forming. However, it is very thick. I mean VERY thick, which makes wearing eye shadow virtually impossible. I know it's supposed to be used for day, but I love this at night and effect lasts next day if I don't wash my face. I feel like this product is proactively preventing deepening of my wrinkles. So thankful for this during the winter. A little goes a long way and it needs time to soak in before applying any eye make-up. It moisturizes and plumps the under eye area for sure! First time trying the brand and loved this balm, best I've tried so far. I really like the smell of this product and was hoping it would be something that I would use daily, but I find that it is too thick (solid) and therefore difficult to apply and feels a little greasy after application. I would prefer something that is a little smoother and easier to apply under the eye. This product has worked great for me under and around my eyes. I been using it a few years! Works for me ??! Its a must have in my skin care products . I don't understand why this eye balm is so thick (actually feels like it could have some beeswax in it), since the skin under my eyes is so delicate. I was hoping this would feel like a treat for my eyes, but that is not the case. I much prefer the regenerating eye cream. I love this stuff, better than the more expensive creams I bought at Sephora by that other doctor. Their product was full of dimethicone and it caused me to get stye's under my eyes! This stuff is SUPER thick when they say smaller than a grain of sand they mean it! I use about that much and it's enough for both of my eyes. But the best part is that it hydrates without causing stye's. Its worth the money especially since it'll last forever! I was looking for a product that would help prevent wrinkles and keep the skin around my eyes moisturized and comfortable during winter. Very happy with this product! This time of year my eyelids get dry and itchy. The neem oil in product is amazing and not greasy! I use it now all over my eye kids and under eyes and am amazed how bright my eyes look! Great winter product for our eyes. Yes. Eye Balm! Not suitable for Asia climate, I think it's a winter product. Ended up using it as a lip balm. 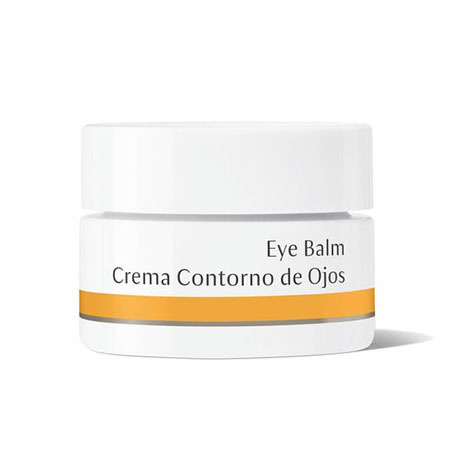 This eye balm is a good product, it does moisturize the skin, but it does not absorb quite as well as the Hydrating and Regenerating Eye cremes do, and it does leave significant greasy-looking residue, so I could not use it under make-up at all. I liked using it in cold temperatures in winter for a little extra protection, but only without make-up. I love the feel of Dr. Hauschka's Eye Balm and it really helps diminish the dark circles under my eyes and smooth the crepe-like texture of my eyelids. I have been searching for a replacement eye cream for 6 months as mine was discontinued elsewhere. I was so happy with the results with the Eye Balm that I'm no longer fretting over loosing my long-time standby. Thanks for making such quality products! I am literally obsessed with the skin around my eyes, I have spent thousans of dollars on eye creams and so far have not found one that will make the skin around my eyes firm and lifted again, and this is no exception, I have not noticed any difference on my eyes. The still looked tired and saggy. Love the tangy smell. Takes a while to dry, can look greasy. Hi Viridiana, Here's a tip to help reduce shine, if that is an issue: Try using a very small amount of the eye balm on the area around your eyes. As you probably have found, a little goes a very long way. Apply gently, then after it has warmed on your skin, if you see shine, give it another gentle pat to press into the skin. This can lift off excess and reduce shine. Love this eye balm which seems to plump the fine lines around my eyes. Love this product. I've been using it for over twenty years. It is a soothing texture and it does not bother my eyes, clog pores or irritate the skin. Highly recommend . I use this balm on the skin around my eyes to counter the effects of irritation from being around horses and dogs and dust and dry New England air. When the skin on my eyelids and around my eyes is dry and burning and itching I apply a cotton pad soaked in warm water and Eye Solace, then apply eye balm while the skin is still soft and damp. The [soothing care] is immediate and lasting. The balm soon settles into the skin so that I can apply my other Hauschka products and even eye makeup. This is a wonderful product that I will always have close to hand. Excellent hydration for my eyes. I cannot live without this product! For extra care, I like layering the Eye Balm over the Regenerating Eye Cream. I think the added support and protection is especially helpful when spending stretches of time outdoors in dry and/or cold weather. Cleanse with Cleansing Cream or Soothing Cleansing Milk then refresh using Facial Toner or Clarifying Toner. Warm a small amount of Eye Balm (about the size of a grain of rice) between the tips of your fingers and, without pulling or dragging skin, gently apply a thin, even layer to the eye area, starting from the inside corner and working outwards. Especially recommended in colder weather. For extra protection, we recommend applying over Daily Hydrating Eye Cream or Regenerating Eye Cream. Eye Revive offers refreshing care for puffiness, irritation, and redness.